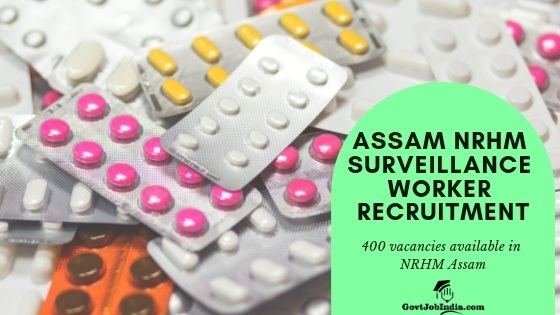 NHRM Assam Surveillance Worker Recruitment 2019: Candidates are invited from all over India to apply for the Assam NRHM Recruitment 2019. In their official notification pdf, the Assam NRHM have mentioned that they are currently holding 400 open vacancies for the post of Surveillance Worker in the Assam National Rural Health Mission. We request that all the candidates who are interested in this recruitment send in their duly filled NRHM Assam Online application form on the official website of the NRHM @ nhm.assam.gov.in. Keep in mind that the last date for form submission is on 16th February 2019. This is a remarkable opportunity for all the candidates who are seeking a govt job in Assam. This is especially true if you satisfy the bare minimum educational qualification of the 12th pass which is needed for the Assam NRHM recruitment 2019. So if you are candidates who are seeking a govt job after 12th pass, then look no further as the NRHM Assam Surveillance Worker Recruitment is the opportunity you have been waiting for. All the details you need regarding the Assam NRHM Surveillance worker salary, eligibility criteria, selection process, and the recruitment exam have all been explained in great detail below. Kindly ensure that you go through this page before you start to apply online for this amazing opportunity to attain a Govt Job in Assam. Candidates are requested to kindly note that 4% of the total number of seats will be reserved for PwD candidates. This totals up to an amount of 16 seats which will be reserved for the Physically Handicapped. Required Educational Qualification 12th Pass from a recognized University or State board. It would be helpful for your cause if you have some prior experience in the Medical Service Sector.preferably in Field Surveillance Work of NVBDCP & other related programmes. How to Apply Online for NRHM Assam Surveillance Worker Recruitment 2019? Click “new registration” to open up the online application form. Pick the name of the post you are applying for, in this case, Surveillance Worker. Fill accurate details without making any errors. Mobile number and email id are mandatory for NHM Assam Surveillance Worker Online Application. All communication from NRHM will be made through the mobile number and email ID you supply during registration. You can now proceed to pay the NHM Assam Surveillance Worker Application Fees via net banking, debit card or credit card. We hope you are able to complete your NRHM Assam surveillance worker Online Application form using the details provided above. It is highly recommended that you go through this page and ensure that you are eligible for the post of surveillance worker before you send in your online application. We wish all the very best of luck. Feel free to direct any and all doubts you may have regarding the Surveillance Worker Recruitment in the comment section below. Our team will help you out with any doubts you may have.